I exchanged some photos with Martin from dibujandoarte. Edit: He had just posted his versions of the photos I sent him and he did an amazing job! He’s very talented and tried colour, and soft romantic drawing…of course I like that one, hie hie! And he even threw in an artistically expressive one. See what he’s done here. This first one I did of him is done in graphite. My objective throughout the drawing was to have lost edges, definite lines, soft marks, dark shadows, bring some of the background into the drawing, keeping the work loose and staying within three values. The pen drawing was relatively successful, until I carried on fiddling with the eyes and thus making them change into values, putting them out of context with the rest of the sketch. I only wanted to capture the different planes and shapes with contiuous linework, without worrying about likeness or values. If this is what Martin looks like, what a handsome guy! And I must add, what a very nice man he is as well. Your graphite sketch is just beautiful! I am sure he is very happy with these!! Is he doing your portrait in exchange? 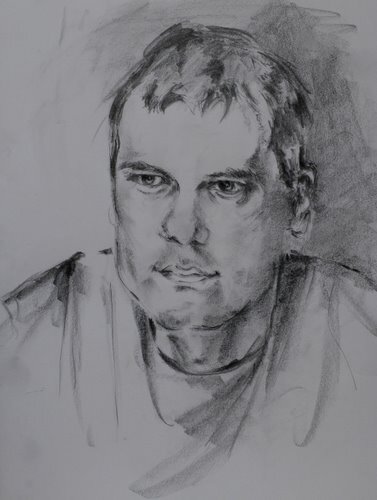 I agree, super graphite sketch…It looks more like charcoal, so loose and typically Ronell! Martin will be thrilled I’m sure! Wonderful sketches Ronell! You definitely met your objectives. The graphite sketch is my favorite – such wonderful marks all in the right place, loose and confident. Some day I would love to get my drawing style to look more like this. Right now, my drawings are much tighter. I had better start practicing – A LOT! I’m not at all surprised that that is what Martin looks like! What a soulful sketch—and I know how hard that is to do from a photo. I hope and trust he’s doing one of you, too—it is a portrait exchange, right? This is a beautiful soft, sensitive graphite portrait. What a light touch you have! Wow! your objective has been accomplised. I’m really amazed at the ressults you got on the graphite one. I like the detail on the eye-ear, it’s always amazing to see how a complex image can be realised using some shadows and strokes, our eyes complete the whole thing. You’ve done a WONDERFUL JOB Ronell!!! I’m posting the ones I’ve done in some minutes. Hugs and let’s keep in touch. 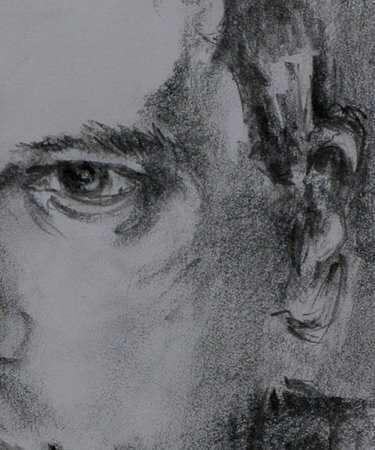 The graphite sketch is hauntingly soft and soulful. Fantastic! and like the others above, I hope to see his sketch of you. Always a lesson here. Very good the graphite. Oh I love these, very nicely done. I think you managed to succeed in keeping your values to only three.I bet this was really hard, but I think it makes it more dramatic. Great job!! Ronnel,this is a lovely, sensitive portrait. Lovely expression. Isen’t it amazing how much media effects the whole expression?? NICE! Ronell you should be pleased! Very sensitive drawings… now I’m off to check out you…. by Martin! Wonderful graphite portrait, Ronell. Beautiful treatment of the eyes too. Brava!!! This is really something – there’s so much depth to it. A really nice portrait of a very handsome guy! The graphite portrait is beautiful. I really think graphite works really well for expressing the softer and more reflective side of a subject. Excellent work with the values. amazingly beautiful work Ronell – I bet Martín is thrilled. 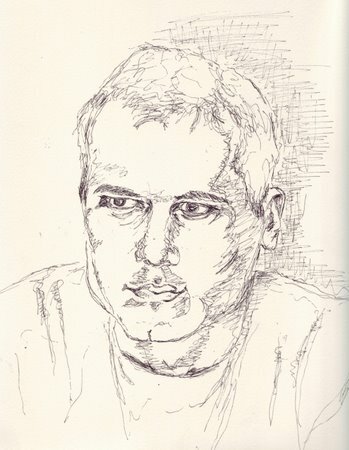 Nice drawing and cool idea, the portrait exchange.